DJ America disc jockeys energize their crowds with experienced announcers using time-tested requests and interactive techniques. Our smiling, dynamic announcers have entertained for tens of thousands of people just like yourself and understand that we don't get a second chance to make a good first impression with guests. We provide high energy and fun. 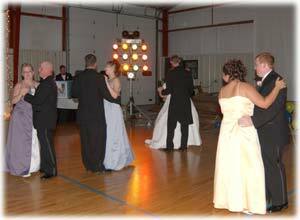 Your party will crackle with electricity from the first dance to the last song. You can rest assured that your DJ America disc jockey will be a friendly, well-dressed, professionally trained announcer equipped to deliver a reliable, enthusiastic performance. No first time rookies for your special event. No rambling, clueless DJ wanna-be's disguising themselves as pros. Crowd-motivating DJ America disc jockeys walk the walk and deliver with an insprired, prepared performance customized to your needs. Some of our announcers have performed at over 1000 appearances. Each of our sound systems has been designed to provide crystal clear, distortion-free, state of the art music reproduction. And yes, YOU control the volume to appropriate levels. One of the biggest compliments DJ America receives is "
DJ America's continued growth is due in large part to problem free performances. Our Masters of Ceremonys pride themselves on running your event smoothly and keeping your guests informed with special announcements. Problem free shows are a result of showing up early, being prepared with thousands of requested songs and catering perfectly to the needs of you and your guests. 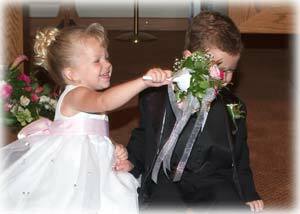 Attention to detail and pre-dance planning are keys to a worry-free, problem free evening of fun at your event. Why do more and more people just like you choose DJ America for their event? Maybe it's for the peace of mind that comes knowing that your dance will be handled by an experienced and seasoned pro behind the microphone. No hassles. No worries. No excuses. Our music library is updated frequently with current hits from your favorite artists. 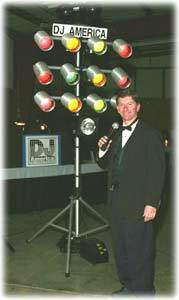 our announcers will gladly incorporate your music requests and your guest's requests into that evening's presentation.